July 12, 1931: "More than 5000 acres of timber have been scorched by the fast spreading fire on Hemlock creek and Lean-to ridge in the Clearwater forest in northern Idaho, forest officials said here tonight. The flames were racing up Hemlock creek and advancing toward the Lean-to Ridge Lookout. 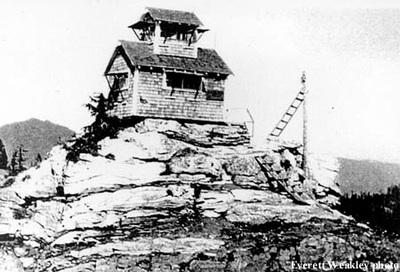 1917: 20-foot pole platform with shake wall cabin built under tower. 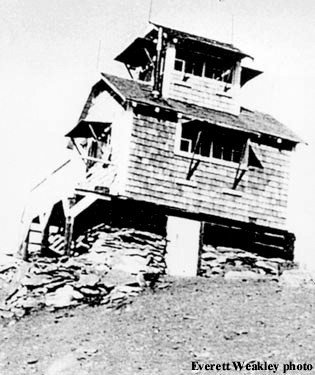 1930: Log cabin and L-6 tower. c.1934: 100-foot pole tower with L-6 cab and cabin. 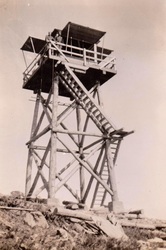 c.1934: 40-foot pole platform, cabin at north end o fridge. A crow's nest lookout point approximately one mile southeast of Toboggan Hill Lookout. 1968: 10-foot treated timber tower with a R-6 cab. An approximately 20-foot high round timber tower with enclosed cab (L-5 - L-6), used as a patrol lookout about one mile southwest of Black Mountain Lookout. 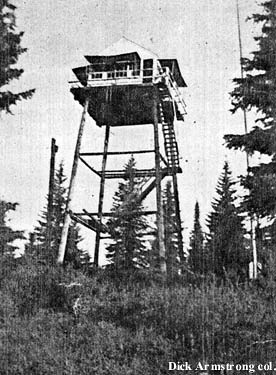 1933: 100-foot pole tower with L-6 cab; log cabin living quarters. 1948: 86-foot steel International Derrick tower, military surplus airport tower. Moved to museum in Pierce.